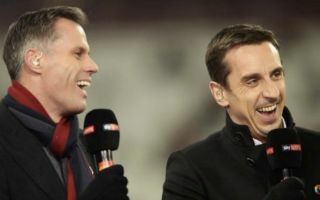 Manchester United legend Gary Neville has surely attempted to wind up Liverpool fans with his tweet about who should win this year’s Ballon d’Or. Answering fans questions on Twitter, the former Red Devils defender has aimed a number of digs at Liverpool, even if he did admit he’d love to see his old club sign their star defender Virgil van Dijk. Neville spent his entire career at United and is known for his hatred of Liverpool, having famously wound their fans up at the end of one dramatic win at Old Trafford. We very much assume he means Real Madrid captain Sergio Ramos, who is undoubtedly one of the best defenders in the world, though we imagine Neville is a fan for other reasons as well. The Spaniard notably injured Liverpool’s Mohamed Salah in the first half of the Champions League final at the end of last season, in a moment that looked to majorly turn the game in Kiev, with Ramos ending the night lifting the trophy for the third year in a row. Elsewhere in his Q&A, Neville said he’d rather the club he part-owns, Salford City, got relegated instead of Liverpool winning the Premier League. The Reds and United have a long-standing rivalry, and the Manchester-born Neville clearly takes it very seriously!